He’s the recipient of a Guggenheim Fellowship (2007-08), two National Endowment for the Arts grants, a Fulbright award, and four Pushcart Prizes, among other honors. Most recently, he was awarded the 2009 Tampa Review Prize for Poetry for his manuscript Rolling the Bones. 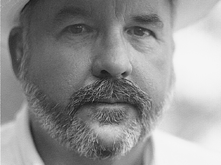 "Chris Buckley is an energizing, humanistic poet whose talent for capturing human drama in cosmic terms doesn't prevent him from looking closely at our day-to-day doings and celebrating them," said Stephen Gutierrez, professor of English and event organizer. "He's got a big heart, a wise mind, an all-encompassing sensibility. He's one of our finest poets." Born in Lompoc, Buckley was raised in Santa Barbara and educated at St. Mary’s College (BA), San Diego State University (MA) and the University of California, Irvine (MFA). When not writing or reading, he a professor of creative writing at UC Riverside. Christopher Buckley's ninth book of poetry, Fall From Grace, was recently published by Bk Mk Press/Univ. of Missouri, Kansas City. With Gary Young, he has just edited The Geography of Home: California and the Poetry of Place (Hey Day Books, 1999). too many stars ever to be of use. the little you have left to offer? scuttle along the sidewalks, up hill, suspended and darting in the alleyways. Each November galaxies of dry leaves and bracts spin away. scientists have shown that everything returns to something—dust to . ..
star dust, of course, so literal, remote, so cold. painting, well, a brilliant means, not a source burning in and of itself. spirit at one bright end and blood-dull earth at the other. stars the only dim points to show where they were heading on earth. water falling through water, no annotations in the paraffin sky. could not have said it then as I calmly released myself to the cold seconds burning by, to that point where I felt the electron click of blue and yellow light at my fingertips flash out above the salt static and the froth, to burst clear, breathing where light was my only future, and not all that far removed.